Our Chicago commercial litigation attorneys routinely handle matters involving the enforcement and breach of promissory notes – see also contract disputes. A promissory note is a legal document signed by an individual or business entity promising to repay another party a specific amount of money pursuant to a set of written terms and conditions. A properly drafted promissory note will cover such matters as the lender’s obligation to make the loan, the borrower’s representations and warranties, covenants to be observed by the borrower while the loan is outstanding, the method of calculating and paying interest, provisions covering optional and mandatory payments of principal, and the rights and remedies of the lender, and whether the debt is unsecured or secured by certain collateral of the borrower. 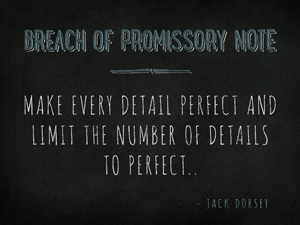 The promissory note is the primary loan document that evidences the borrower’s legally enforceable promise to repay. Promissory notes are among the most common forms of commercial paper used in business and commercial transactions. They are used to finance transactions and fund business operations. Their creation and exchange are also governed by UCC Article 3, which defines what constitutes an enforceable promissory note and the rights and obligations of the parties to the promissory note. A promissory note is a legally binding contract evidencing the obligation of one party (the borrower) to pay a fixed amount of money on demand or at a specified future date (or dates) to the other party (the lender). A valid promissory note contains the same elements as any other valid contracts, such that there must be: (1) an offer, (2) an acceptance, and (3) consideration (bargained-for exchange). The basic elements of a promissory note should contain the following provisions (at a minimum): (1) the identity of the borrower; (2) the identity of the lender; (3) the principal amount of the debt; (4) the method of calculating interest; (5) the times principal and interest are payable; and (6) right of the creditor to accelerate the maturity date upon default. The elements of a breach of promissory note are the same as those for a breach of contract: (1) the existence of a valid and enforceable note, (2) performance by the lender, (3) breach of note (failure to pay according to the terms of the note) by the borrower, and (4) resultant injury to the lender. Keep in mind that a statute of limitations applies to any breach of your promissory note. The statute of limitations will usually begin to run on the date the contract (the note) was breached. Be payable to order or to bearer. Promissory notes are among the most common forms of commercial paper used in business and commercial transactions. Promissory notes are typically used in financing transaction, such as a business sale, or in a business loan context. If you or your business seeks representation to handle a breach or enforcement matter concerning a promissory note, please contact our law office for a free consultation. As with any business contract, promissory notes are not all the same. The two primary types of promissory notes are secured (or collateralized) promissory notes and unsecured promissory notes. Secured promissory notes specify certain assets that may be used as collateral to pay a debt in the event of a borrower’s default pursuant to the debt agreement (or promissory note). Unlike a secured promissory note that is secured by certain assets, an unsecured promissory note is not secured by any assets which may be used as collateral to pay the unpaid debt in the event of a borrower’s default. It is common that promissory notes, especially in a business context, will require another individual or business entity to provide a personal guarantee. For example, if an entity borrows capital and the entity does not have a strong financial history, the lending party will often require another individual or entity to execute a personal guaranty agreement as security in the event the borrowing entity defaults. If the borrowing entity defaults, the lender may seek payment of the unpaid debt against the the party providing the guarantee. A personal guaranty provided in connection with a promissory note are enforceable and will bind the party signing the personal guaranty in the same manner as the borrower who signed the promissory note. A lawsuit for a breach of promissory note is initiated by filing a complaint, which sets froth the breach of contract and requests the court for damages to be awarded to the plaintiff (generally the lender). A complaint for breach of promissory note is typically filed where the borrower (or defendant) lives or conducts business, where the promissory note was formed, or where the promissory note specifies the governing court or jurisdiction. Damages may be, among others, items such as the unpaid balance due, interest, court costs, attorney fees, and other damages specified in the promissory note. The complaint must be served on the borrower (or defendant) and a certificate of service is attached to the complaint to prove service was made. Suing to collect a debt evidenced by a Promissory Note is one of the easiest types of lawsuits to handle. Contact our Chicago law firm at (312) 789-5676 , or by email, to consult with one of our Chicago business litigation attorneys to discuss your breach of promissory note matter.